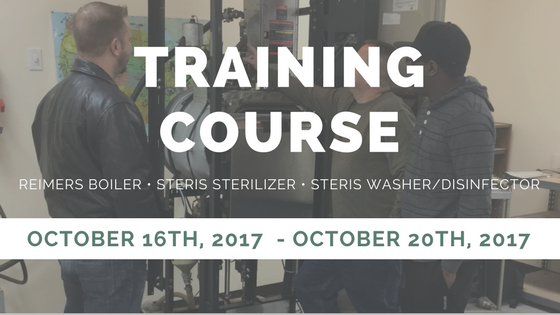 The course will be offered October 16th – 20th, 2017 at Auxo Medical in Richmond, VA.
October 20th, 2017 – Review for the final half day. To Enroll, send a Purchase Order to Auxo Medical LLC with the names and phone numbers of each candidate that will participate. Payment for each candidate will be required by September 29th 2017. Each Student will receive a hard copy or electronic copy of each of the manuals above as well as the Auxo assembled Training manual complete with detailed information and photos as well as a copy of the Steris Synergy Series In-service Video. Trace and identify all components of a typical steam generator used with Sterilization equipment.